In August 2012, Dr. Amit Bhandari has been chosen for the individual achievement Gold Medal Award of "Shining Image of India" by News Live - AIESAC. Ayurveda Expert & Research Scholar with America based companies. Dr. Bhandari has been selected for the prestigious INTERNATIONAL GOLD STAR MILLENNIUM AWARD for 2010, by the Citizens Integration Peace Society, New Delhi, India for his work in the field of research. Dr. Amit Bhandari M.D. (A.M.), one of the most sought-after Doctors of his region, is a graduate (Bachelor of Ayurvedic Medicine and Surgery) from India’s oldest Ayurvedic Institute- Dayanand Ayurvedic College, Jalandhar (Pb.).India. Dr. Amit Bhandari is a popular herbal expert and has been serving humanity by guiding them to get practical treatment of Chronic cold, Gastric insufficiency, Skin Disorders, Gynaecological problems, Infertility, Obesity, Piles, Benign Prostate Hypertrophy, Asthma and Hair Fall. Dr. Amit Bhandari is the Director of *BR. Herbals Ayurvedic Hospital TM, Jalandhar (Pb.) India. He has gained reputation as Prakriti (BODY-MIND Constitution) Analyst and Ayurveda expert physician for using Herbs, Diet & Life style guidance, and Panchakarma scientifically for the detoxification of the body, to diagnose and resolve chronic diseases of the sick Human Body. He has been working as C.E.O. & Chief Health Advisor with Risash Organics Pvt. Ltd. which has opened its Organic~Herbal HEALTH FOOD STOREs (HEALTH GARDEN) and HEALTH CAFEs (ORGAFE). This was Dr.Bhandari's first real world project after extensive research work in his field. He provides practical resolve and solution to the chronic problems of the patients of all ages and even has completely resolved the incurable diseases of the ailing world. He owned HEALTH GARDEN Organic Food Store in August, 2013. Dr. Bhandari was nominated as recipient of prestigious honorary Ph.D. Degree by New Age International University (N.A.I.U.) Italy, Europe for his contribution in the field of Ayurveda and herbals, in March 2006. Dr. Bhandari has been selected for the prestigious Rajiv Gandhi Shiromani Award for 2009, by the National Integration and Economic Council, New Delhi, India for his work in the field of Indian Medicine. Dr. Bhandari has been selected for the prestigious Sadbhavna Award for 2009, by the Citizens Integration Peace Society, New Delhi, India for his contribution to the nation by acting as link between India and America in the field of research. Dr. Amit Bhandari is working as an expert since November 2006 in the field of Alternative Medicine and Ayurveda with Live Person and Kasamba, one of the world’s biggest online consultation companies, with high rating of customer satisfaction. Dr. Bhandari has been writing articles and practical experiences concerning common single spices & herbs having medicinal values, in health concerned magazines and journals to guide general public from time to time. 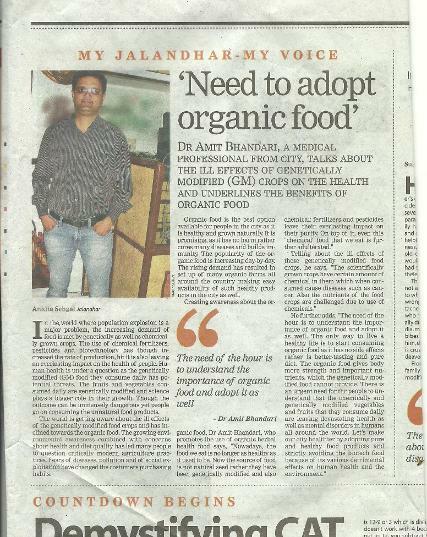 Dr. Amit Bhandari got Ayurveda in his blood from his older generations as he is the grandson of a renowned Hakim B.R. Syal of Chandigarh, who served humanity for about 70 years. Dr. Bhandari is skilled in preparing Research based Herbal Formulations for curing patients with Herbal Powders, Juices and Extracts according to the Body-Mind Constitution of a particular individual.